That was the advertisement that Mr Devin Jones one Summer reacted to, and this stand up guy at the age of twenty one was soon to become Howie the Happy Hound suited up in Hound attire doing the Hokey Pokey dance with kids at Joyland, a fun amusement park, a place where fun was lived out in its highs of rides and pitch darkness of the Horror House. 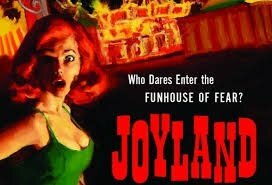 There is unfortunately no tunnel of love, just in case anyone reading wants to hope on a flight out to Joyland. The nearest to a tunnel of love is the Horror House but as you embark on that ride, with zombies and skeletons leaping out of nowhere to surprise you in the dark, watch out for any lonesome dame stranded, lurking, wearing a blue skirt and blue sleeveless blouse and a matching blue Alice band, she is not part of the outfit, the fun, she is out of place in Joyland, her presence, the mystery behind her, the suspense that surrounds her is the hook in the tale, one of which our master storyteller Mr Stephen King has used to great success i have to say, one to have you hooked and transported to this summer and the lead characters days working at Joyland. 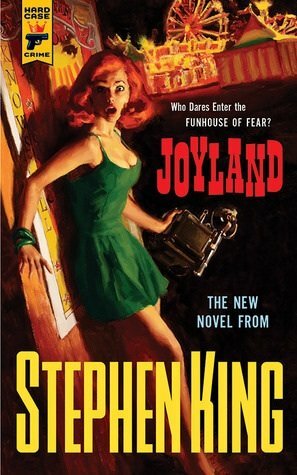 Published by Hard Case Crime, a publishing house that specialises in suspense, mystery and noir, its no surprise that King chose them to tell this throwback suspense and mystery story. He has used a great setting a theme park, just liked great stories such as Something wicked This way Comes by Ray Bradbury, a memorable and strong character is present with the young protagonist Mr Devin Jones with hero qualities and some flaws, and another even better character Mike a young boy who is severely ill and wheelchair bound, you will also read of some love for the main character one gone and a possibly another to be gained. This story has the reader ponder and read over the good days that have past, the love that was lost and found, the death that was faced and the life that managed to live on, a quaint feeling left upon the reader cast, on the good people lost and struck from this earth but the wonderful memories that lay and they left behind. Joyland somewhere, somehow, may be found across the world, across seas and across lands, in hearts and minds, through efforts and great human endeavor, in fun-houses, parks, and happy days, everyone has some fun-house days to remember, recollect and reflect on the silver-lining and on the others of whom have left behind a memory gone from this passing world but never be forgotten. 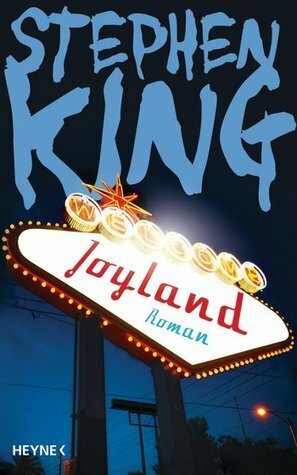 A modest story can have great ramifications and reverberations, there is a power present in this great storytelling and of one I am in awe of Stephen Kings ability to do right, he connects and transports his reader. 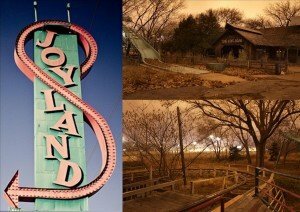 In this tale he weaves you slowly in, with the telling of the main character Devin Jones and his humble efforts on a summer job at Joyland, a place of fun, and slowly revels some darkness and then some light with the great character Mike and his dreams of being out of his wheelchair high up in the sky on a ride, like the kite he regularly reels from his seat, as dreams are forged, and he breathes the air you have the great feeling of freedom he must have felt and then the darkness comes again and then…….the rest lays in wait for you to read this Summer, run and buy it in truck loads and give out for free. “Already been warned by Mr. Dean,” I said. “Figures. Anyhow, the Hollywood Girls are told to concentrate on family groups and dating couples who look over twenty-one. Kids younger than that usually aren’t interested in souvenir photos; they’d rather spend their money on food and arcade games. So the deal is, the girls snap first, then approach.” She did a breathy little Marilyn Monroe voice.